means "before the meal" and is the traditional first course of a formal Italian meal. Traditional antipasto includes cured meats, olives, roasted garlic, peperoncini, mushrooms, anchovies, artichoke hearts, various cheeses (such as provolone or mozzarella) and peperone (marinated small green bell peppers, not to be confused with pepperoni). The antipasto is usually topped with olive oil. Many compare antipasto to hors d'oeuvre, but antipasto is served at the table and signifiesthe official beginning of the Italian meal. It may be referred to as a starter, or and entrée. 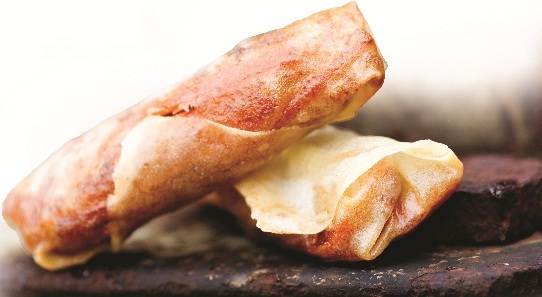 A pair Phyllo parcels filled with spinach and Danish feta. Served with our home-made cheese sauce and French salad. Imported Parma Ham, Coppa, Mortadella and Salami; Thinly sliced and served with Giardiniera (pickled vegetables) and Bruschetta. Plump snails smothered in rich garlic butter, served on mushrooms and topped with garlic butter or Blue cheese sauce. Served with bread fingers. A mix of crumbed beef, chicken, pork and fish strips. Served with chips and a spicy mayo sauce. Springbok fillet sliced thinly and topped with olive oil, Parmesan slivers and rocket. Simply the best South African dish! Fresh beef fillet very thinly sliced topped with olive oil, Parmesan slivers and rocket. A traditional Italian dish. A 10% service charge may be included in the bill.